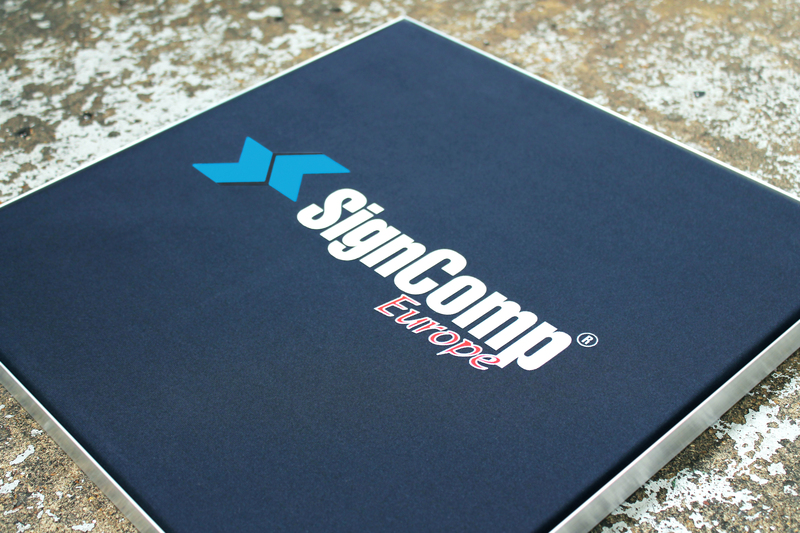 Here at SignComp Europe, we offer the brand new and patented tension fabric system - EASITEX. The EASITEX sign system is the next evolution in textile signage and offers a number of advantages over traditional soft signage systems. These advantages stem from one major difference, EASITEX does not require any silicon strips - no need to sew or fabricate your textile print! This simple change results in a product that is more cost-effective and more environmentally friendly whilst offering quicker turnarounds and more reliability. No need to purchase an expensive and large sewing machine and no need to sew a millimetre perfect line on your print, just make sure your print is slightly larger than your frame and you are good to go. All of this and you have a great finish every time - no wrinkles and no sizing issues. Textile signage just got easier! EASITEX is designed, made and manufactured in the UK to the highest quality. Its simple design means assembly is easy and coupled with our bespoke tension tool, installation is a breeze. EASITEX currently comes in four different depths – 25mm, 50mm, 80mm and 100mm double-sided. We distribute our EASITEX Tension Fabric System to customers throughout the UK and Europe in either bar lengths for manufacture or in kit form ready for printers. For more information on EASITEX, please see the information below or get in touch with SignComp Europe and we’ll be more than happy to assist you. EASITEX is a brand new patented product that could be a great opportunity for your business to grow or adapt. Contact us today for more information on the system. EASITEX textile signage is NOW AVAILABLE with bar length sales! EASITEX Kit sales will commence the July after – If you have any questions regarding this timeline, please do not hesitate to contact us.